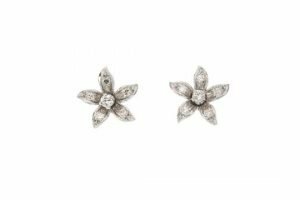 A pair of diamond floral ear studs, each designed as a brilliant-cut diamond within a single-cut diamond petal surround. Estimated total diamond weight 0.25ct. 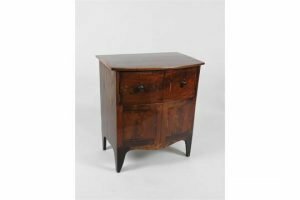 A Regency mahogany rosewood crossbanded bow front night cabinet, the two hinged doors fitted with turned knob handles over two crossbanded panels, a shaped apron on tall shaped bracket feet. 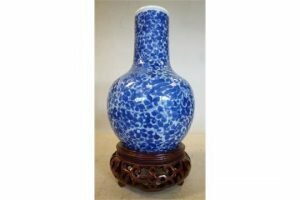 A late 18th/early 19th Century Chinese porcelain bottle vase, decorated in blue and white with two Phoenix hidden within dense foliage, on a turned wooden stand. 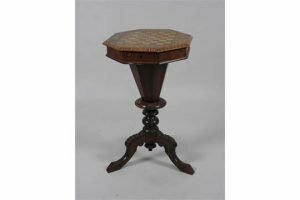 A Victorian walnut chequer board topped octagonal pedestal work table on tripod base. 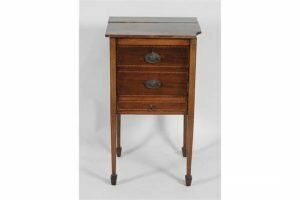 A 19th century mahogany pot cupboard, the cabinet door in the form of two faux short drawers over a shallow drawer, on square tapering boxwood strung slender legs terminating in spade feet. 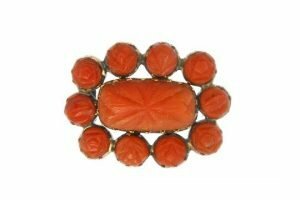 An early 19th century coral memorial brooch, the cushion-shape floral carved coral cabochon, within a circular-shape floral and foliate carved coral surround, to the glazed panel reverse. 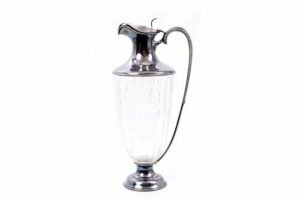 A George V silver mounted cut glass claret jug of classical form, with cut floral swag decoration, silver top of ewer form, scroll handle and domed foot with beaded borders, hinged domed cover with pierced thumb piece. 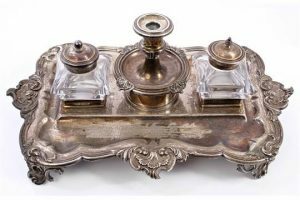 A fine quality William IV silver inkstand of shaped rectangular form, with shell and foliate border, on four scroll feet, pair cut glass inkwells with silver mounts and a separate taper stick. 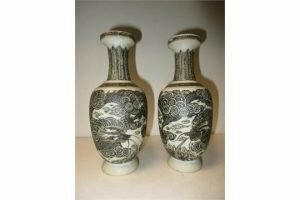 A pair of 19th century black decorated biscuit vases, the necks painted with stiff leaves over ovoid bodies with mirror images of dragons in clouds above waves, six character marks of Kangxi. 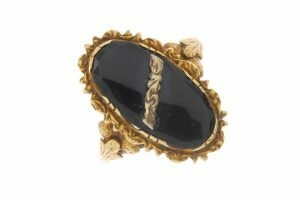 A mid 20th century onyx ring, the oval onyx panel with foliate surround and central highlight, to the scroll engraved band. 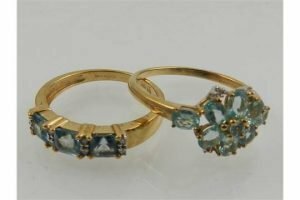 A 9 carat yellow gold and blue topaz floral cluster ring, together with a 9 carat yellow gold and blue topaz three stone ring, the stones interspersed with diamond accents. 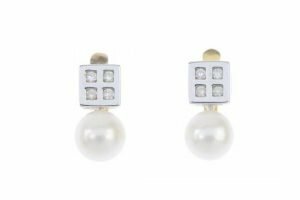 A pair of diamond and cultured pearl earrings, each designed as a cultured pearl, to the brilliant-cut diamond quatrefoil surmount. Estimated total diamond weight 0.15ct. 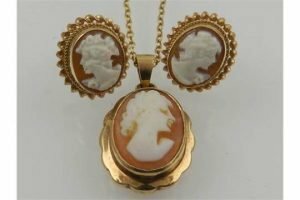 A 9 carat yellow gold and cameo pendant on a 9 carat yellow gold chain, together with a pair of 9 carat yellow gold and cameo stud earrings. 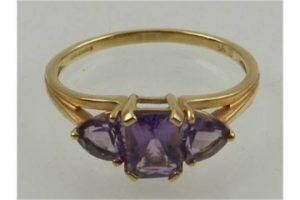 A 9 carat yellow gold and amethyst three stone ring, set emerald cut central stone flanked by two trillion cut amethysts. 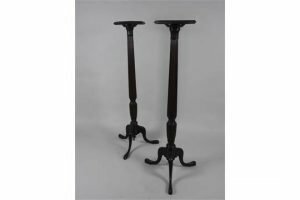 A pair of mahogany bedpost torcheres with octagonal tops, on slender octagonal reeded columns and tripod base. 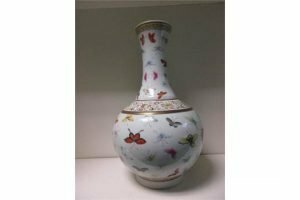 A 19th century famille rose bottle vase, six character mark of Guangxu, ruyi lappets in a band on the rim, scrolling flowers on the shoulders and lappets above the foot with butterflies flying in between. 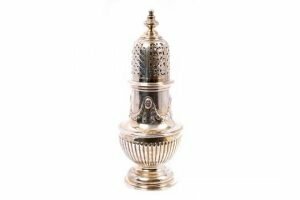 A fine quality late Victorian silver sugar caster of baluster form, with classical swag decoration and fluted lower body, detachable pierced cover with turned finial, on domed circular foot. 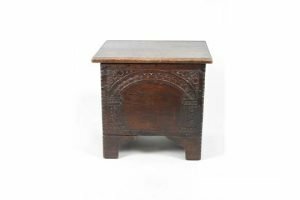 A 17th century style boarded oak box, with hinged lid over an arcaded front and tall bracket feet. 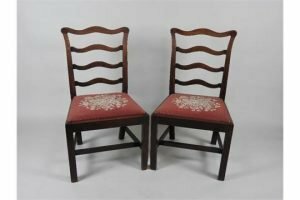 A pair of 19th century mahogany country Chippendale style wavy ladder back dining chairs. 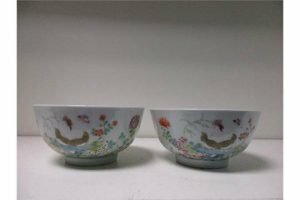 A pair of famille rose bowls, six character marks of Guangxu, each painted on the exterior with two quails resting on blue rocks amongst flowers.